For many inside and outside the legal academy, the right place to look for law is in constitutions, statutes, and judicial opinions. 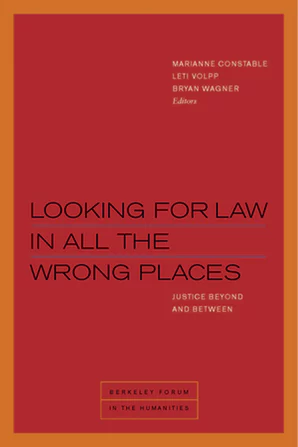 This book looks for law in the “wrong places”—sites and spaces in which no formal law appears. These may be geographic regions beyond the reach of law, everyday practices ungoverned or ungovernable by law, or works of art that have escaped law’s constraints. Looking for Law in All the Wrong Places brings together essays by scholars of anthropology, cultural studies, history, law, literature, political science, race and ethnic studies, religion, and rhetoric, to look at law from the standpoint of the humanities. This Book Chat features selected co-editors and contributors discussing the volume and answering audience questions. Contributors: Kathryn Abrams, Daniel Boyarin, Wendy Brown, Marianne Constable, Samera Esmeir, Daniel Fisher, Sara Ludin, Saba Mahmood, Rebecca McLennan, Ramona Naddaff, Beth Piatote, Sarah Song, Christopher Tomlins, Leti Volpp, Bryan Wagner. This volume is part of the Berkeley Forum in the Humanities series, which features topics of broad interest in the humanities and interpretive social sciences, with a focus on work cultivated at the Townsend Center.